Grant Armstrong and John Welsh of Tayside Precision Tools with their new milling machine. A Dundee engineering company which went under during the oil and gas downturn before being resurrected by two employees is now investing in new equipment and additional staff. John Welsh and Grant Armstrong bought the assets of Tayside Precision Tools after the company was liquidated four years ago. The firm, based at Coldside Road, has since gone from strength to strength in line with the upturn in the oil and gas sector. Co-owner Mr Welsh said the company was looking to recruit an additional two staff. He said: “Four years ago the company went bust after trading for 20 years. “I was the foreman at the time and, with a colleague, we used our redundancy payments to buy the company and its assets and start trading again. Since then we’ve made it into a very successful company. Mr Welsh said his company specialised in “awkward” jobs with his client list including many prominent oil and gas firms. 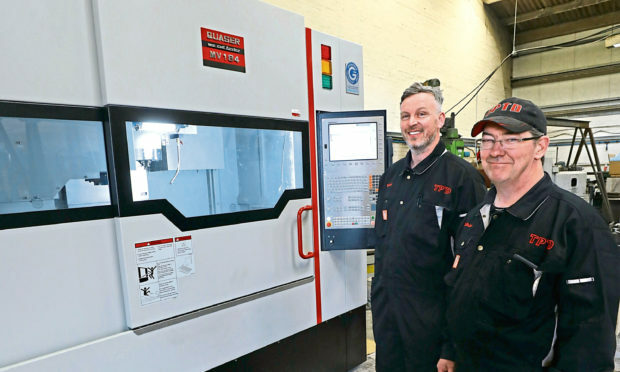 The company has taken delivery of a new milling machine which cost in excess of £100,000. “We have an older machine that does similar work. If that ever went down it would be a major issue for the business as we’re at capacity. The company also services clients in the aerospace, industrial, medical and military industries.